The last time College Gameday was in Louisville was February 9, 2008 when the Cards battled the #6 ranked Georgetown Hoyas in Freedom Hall. The Cards won the game 59-51 and were led by David Padgett with 18 points. 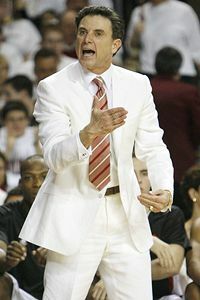 This was the first true “white-out” game that the Cardinals hosted, and the game that Rick Pitino famously sweated through his white suit and had to change clothes at halftime.